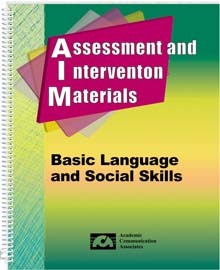 The book includes a variety of observational assessment forms and checklists that focus on basic skills such as expressing needs, requesting assistance, focusing attention, responding to yes-no questions and taking turns. You can use these forms to identify small changes that occur in performance over time. The kit also includes reproducible picture symbols, sign language symbols, vocabulary lists, communication boards, social interaction stories, and instructional activity suggestions for teaching basic language and social skills. The social interaction picture stories help students learn to recognize appropriate social behaviors. An optional CD is available that includes the entire book plus supplemental resources such as full-color versions of picture symbols and communication boards. The CD also includes full-page displays of each picture symbol. You can display these pages on your computer when teaching basic vocabulary to students. Important Note: Full-color picture symbols are included on the CD only. The CD includes the entire book PLUS supplemental materials.